Spokesperson of the National Immigration Authority Hanna Kautto told national broadcaster Yle on Thursday that dietary requirements based on religion had been taken into account and no pork was served to Muslims. In the Northern city of Oulu, some 70 inmates of a temporary facility at the former Hiukkavaara barracks marched to the downtown police office and arranged a protest on Wednesday. On the following day, the Red Cross reacted and said menus in Oulu facilities would be revised, the type of rice changed, more vegetables served and porridge taken off the breakfast. Milk-based food had caused problems for some, and the use of barley as a grain food was found unacceptable among some of the refugees. The protest by the asylum seekers in Oulu was peaceful and a large police force cordoned off the protesters all through the event. The local police expressed concern about the opinion climate in Oulu as negative attitudes towards refugees have increased. 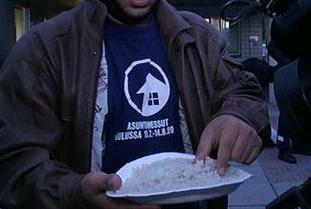 In the center-southern town of Lahti, asylum seekers refused to eat on Thursday. They explained the action was a protest against the Finnish government decision to suspend processing asylum applications. Refugees living in reception centers get an enhanced per diem allowance for the purpose of cooking their own food. Emergency housing centers have no private cooking facilities and hence institutional food is served. The Red Cross has contracted local municipal school kitchens, private caterers or the Lion Catering serving the military. The Immigration Authority told local media that the food served is "standard food and no gourmet."